Expecting to see pics from the drag races? Nope, sorry. As has been happening with increasing frequency, my Friday night last week was another late night shoot-o-rama and I just didn’t have it in me to head out to the track in Sonoma with only 3+ hours of sleep. It just wasn’t going to happen. 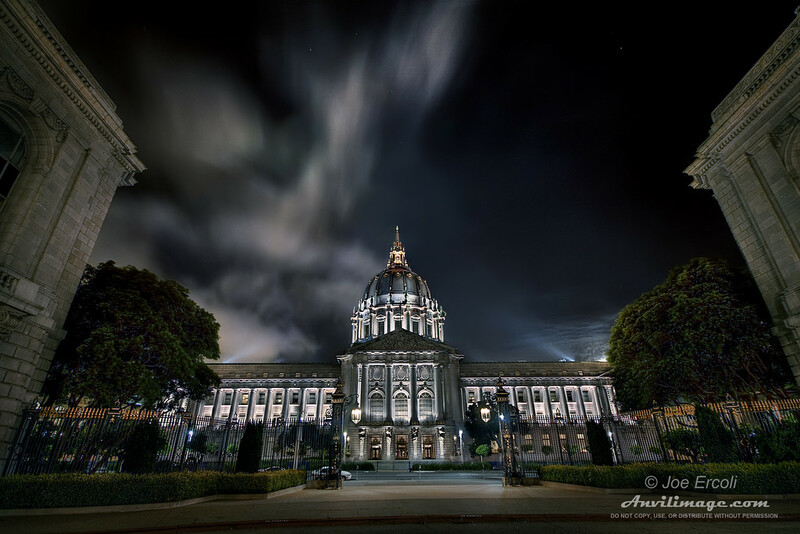 While I regret not going because it has been years since the sound of a top fuel dragster has knocked me so senseless that it made my brain itch, I love grabbing night shots like the one above of San Francisco’s city hall. I’ve been working on this HDR on and off for the past week and I’ve wanted to post it up for you, but I promised myself that I would finish with the MotoGP pics first. Paul came shooting with me that night because his wife was out of town and I have a feeling that this became the first of many night shoots to come for him. He was pretty psyched after seeing his results that night and I think I’ve gotten him hooked. Please check out his photostream on Flickr, too! HDR Info: I shot the images for this HDR with my Sigma 10-20mm lens (10mm) at f4.0 and the camera set at ISO 200 on a tripod. Three exposures were combined with Photomatix Pro and further processed in Photoshop CS4. This entry was posted on Monday, July 27th, 2009 at 3:41 pm	and is filed under Blog, Photos and tagged with architecture, city hall, HDR, night, San Francisco. You can follow any responses to this entry through the RSS 2.0 feed. Joe, This picture is *ucking awesome. You do some really nice work. Its kinda fun when you can play with a hobby that allows to enjoy things around you more. Excellent HDR! POV is wonderful!